Summer Auditions at Midcoast Youth Theater are an opportunity for you (and your parent/guardian) to meet the production team. These are structured events with a goal of allowing the team to best identify who will play what part in our show. Everyone gets a part, because all our shows have large expandable ensembles. So even if you don't get the part you wanted, we still want you in the show as part of the ensemble, which is a really important (crucial and MOST IMPORTANT some would argue) part of any show. Administrative Stuff: You or your parent/guardian must fill out some forms and can pay the troupe fee either at auditions or at first rehearsal (or by other arrangement--see payment form). Forms will be available at the door or you can download them here. These forms must be signed by a parent/guardian. But What Is An Audition Like? There will be chairs for everyone to sit in and when all the forms are done and everyone who is auditioning has been checked in, the team will introduce themselves and the show, and the fun begins! 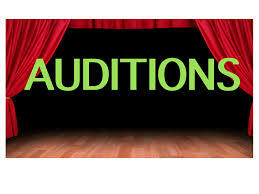 Most people find auditions really fun because people who come to audition love to sing and dance, even if they haven't had much experience with either. No experience necessary! At auditions you will sing together in a group, with our Music Director Courtney Babbidge on piano. And if you want to be considered for a lead role, you will also sing a short solo of your choosing. It does not have to be a song from the show but songs from musicals are better than pop songs. For really little kids, the song Happy Birthday has been a popular audition song! Courtney will be ready to accompany you on piano but even though he seems to know every song, in fact he does not. If you are singing a solo, please bring sheet music to loan him while you sing. With sheet music he really can play anything! No sheet music necessary for Happy Birthday! Depending on the show and how much choreography we expect in a given show you may have an opportunity to learn some simple choreography in a group setting. We'll also divide kids who are interested in leads into small groups and one by one each group will read some lines from the show together, as if they are really doing a scene together! This helps us see how much energy and emotion you can bring to the part while speaking. Be sure to arrive at the start time of your audition. We do the audition in stages as a group so if you come in late you will miss an important part of the process. We're paying attention to your singing and dancing, and to how well you follow directions. So please be respectful and try to relax and then you'll probably have a really good time. The production team is there to help and so are the kids that have been through this process before. We all want you to succeed and have fun!